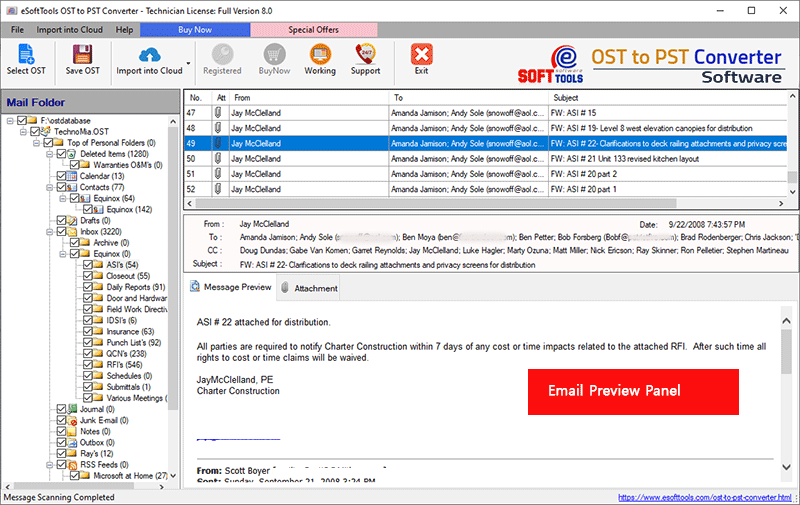 An affordable Solution to recover corrupted, damaged and encrypted password protected OST file and Convert OST to PST file; Use eSoftTools OST to PST Software that is embedded with numerous helpful features to produces better conversion of Outlook offline folders OST file into new Unicode PST file that can be directly import into MS Outlook Application. Superlative OST to PST Recovery Software is an existing with state-of-the-art version and has 100% ability to fix all corruption issues occurred with offline .ost database. Three – easy steps for OST Recovery or Conversion- 1) Load .ost file for scanning, 2) Displays preview of OST items, 3) Convert OST into PST, EML, MSG, EMLX, HTML & vCard formats. Preserve Original Structure - During OST to PST conversion, Software auto preserve folders, sub-folders hierarchy and emails formatting. Option to convert OST Contacts to VCF (vCard) file directly. Converted EML format data can be read in Outlook Express, Windows Live Mail, Thunderbird and all other email clients which supports EML files. Convert Selective Folders - Our OST to PST Conversion tool facilitates to export selected folders to multiple formats. 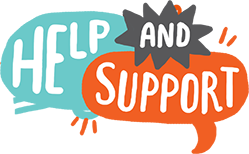 Supports MS Outlook 2016, 2013, 2010, 2007 and all earlier versions. Losing significant emails and items of outlook OST file due to its corruption can be frustrating you, So confidentiality bring into play this extraordinary utility OST to PST Conversion Software and quickly scans complete items of Outlook OST file in order to convert OST to PST Outlook file. Convert OST Software permits users to export selective items from outlook OST file into PST or other formats with maintains data integrity. Marvelous OST to PST Converter Software makes conceivable to hurriedly recuperates the damaged or corrupted emails from Exchange Offline (.ost) files along with each and every emails items, deleted folders emails, address book, calendars, contacts and many more. After recovered OST file quickly save, convert/ Export into PST. As per cutting-edge features conveniences, all the users are sanctioned to select the required folders and sub-folders to convert only selected items of offline OST files into PST, EML, MSG, HTML, EMLX and vCard format. It never harms integrity of OST file data while performing ost conversion. 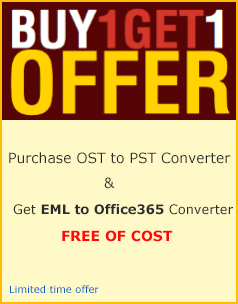 Apart from Export OST to PST, the OST to PST Export Software provides another formats as like- EML, MSG, HTML, EMLX and vCard format that you can pick to convert the all recovered data of outlook offline OST file data. The OST to PST Software easy and simple to use and follows safe steps while conversion OST to PST file; It maintains internal folders organization of xxxx.OST file as it is, while generating PST file. Software won’t make any types of changes in the internal hierarchy of folders, sub-folders or emails formatting (to, bcc, cc, time, subjects and from), embedded images etc. For OST to PST conversion, the software doesn’t requirement of MS Outlook Installation on machine; it means the software is totally free from dependency of Outlook and capable to supports all Outlook versions upto 2016 (32 and 64 bit) to perform conversion. Installing process is totally free from virus and safely Export OST to PST file with preserve data. 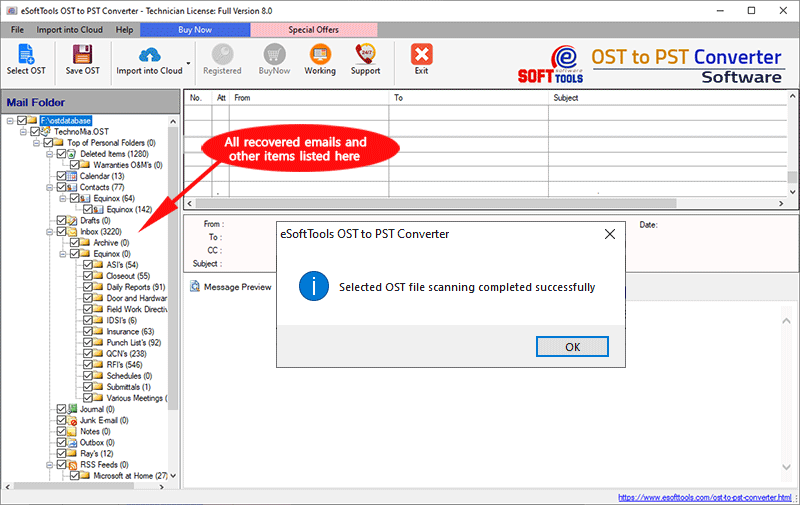 OST to PST Converter Software has the capability of repairing the corrupted or encrypted outlook OST file and also supports to recover the deleted folders emails of outlook OST files along with emails properties, zip attachments and embedded images. OST to PST Recovery Software will create Unicode PST file that can directly supports MS Outlook any versions. Demo Limitation - The Demo Version demonstrate you complete working process and facilitates to export 15 emails from OST to PST. Verifies to load all selected OST file and ready to convert. How can I import converted PST file into MS Outlook Application? * Now select any of the destination options:Import Items into Current folder, Import Items into the Same folder in Now Click “Finish” Option to save the Changes. How much time does OST to PST Converter Software take to perform conversion process? 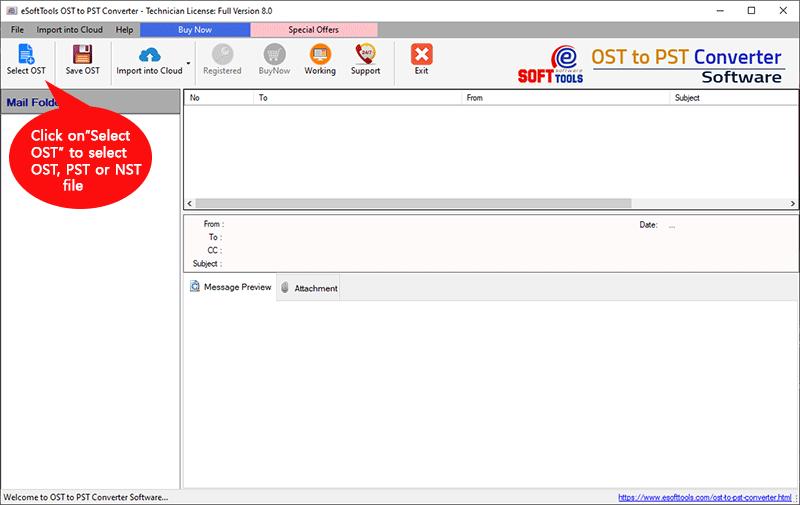 The OST to PST converter Software fast and efficient emails recovery and conversion application, however, the time factor is totally depend on the size of OST file. The bigger size takes more or longer time whereas small size of OST file takes small time for conversion or recovery. I have purchased OST to PST Software but still don’t get the activation code what to do? The delivery of product is given by email (within 15 minutes) upon the successful completion of the purchase. If in case you don’t get activation code then contact with our experts along with complete product details as like- product name, registered emails address etc. Is it conceivable to Export OST file that is not connected to Microsoft Exchange Server? 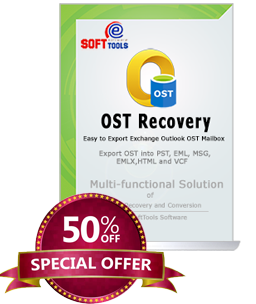 Yes, the OST to PST Recovery Software provides complete data recovery of outlook OST file, even if it is not connected to Microsoft Exchange Server. Does OST to PST Conversion Software support multiple Saving Options? Yes, eSoftTools OST to PST Export Software provides several conversion formats such as- EML, MSG, HTML, PST, EMLX and vCard format. 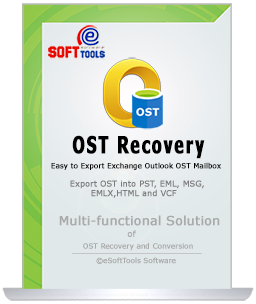 I just want to say thanks to you, just because of your OST to PST Recovery Software I got positive result in recovery of lost, corrupted or damaged OST file emails into EML, MSG or PST format with emails. 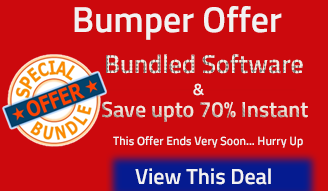 Your software fastly performed for recovery and conversion that is the reason I want to recommend this software to everyone.